Story: Petunia is Porky Pig's girlfriend. Background notes: Petunia was introduced as Porky's girlfriend, in Porky's Romance from 1937. Contrary to other girlfriends like Minnie Mouse or Daisy Duck, she never became famous enough to gain any presence in the cartoons. She appeared in 5 cartoons from 1937 thru 1939, after which she only appeared in Daffy Duck and Porky Pig Meet the Groovie Goolies (1972), Looney Tunes 50th Anniversary (1986), and Bugs vs. Daffy: Battle of the Music Video Stars (1988). After her final appearance in 1988, she started appearing as a child in Baby Looney Tunes from 2002 where she was a regular. After the first year the series went on hiatus except for a direct-to-video movie Baby Looney Tunes' Eggs-traordinary Adventure from 2003, but the series started again in 2005. Petunia's voice was done by Bernice Hansen (except Jane Webb in 1972) until the Baby Looney Tunes stories where Chiara Zanni took over. Right after Porky was adapted in comics, Petunia was right there with him (Four Color #16 from 1942). 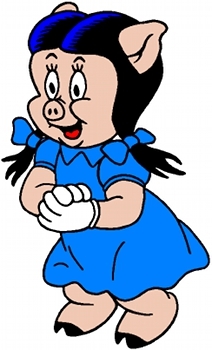 In the comic books she gained some staying power, and she was a regular in the series Porky Pig and Looney Tunes from Dell, Gold Key and Whitman from 1942 thru 1984. When DC Comics rebooted the Looney Tunes as comics in 1994, Petunia made an appearance in issue 3 and 4, but otherwise she has not been seen so far. Her appearance in Baby Looney Tunes show that she is not forgotten as a character and it is therefore quite likely she will start reappearing at some point. Outside the 'natural' occurrences, i.e. comics and cartoons, Petunia has appeared on a little merchandise like figurines, pins and PEZ-dispensers.